Designed to provide the best possible heat protection in areas where high temperatures are always present and problematic, Floor & Tunnel Shield II limits heat transfer on fire walls, transmission tunnels, floor boards, fuel cells and other areas where heat is an issue. Floor & Tunnel Shield II provides excellent light weight thermal protection and as a guard against track and road debris while acting as a sound deadener as well. Constructed with an embossed 10 mil aluminum face bonded to a 1/8” composite glass fiber core backed with a high temp super strong pressure sensitive backing, Floor & Tunnel Shield II withstands up to 1750°F of direct continuous heat and the adhesive side holds past 450°F. Its improved multifaceted modern aluminum surface offers improved reflectivity and rigidity and allows for ease of installation. At only 3/16” thick, this product can be shaped and trimmed for a custom fit and is ideal for minimal clearance areas. 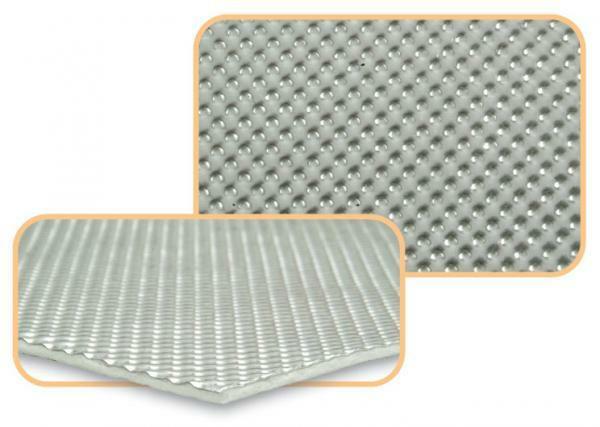 With it’s unique and patented finely woven glass fiber backing, Floor & Tunnel Shield II is the easiest, most cost-effective and efficient way to control thermal transfer and protect expensive components and vehicle occupants from extreme heat situations and serves as a sound barrier. Floor & Tunnel Shield II can be used on any number of surfaces including, metal, aluminum, carbon fiber, plastic and more. Multiple uses include: fire walls, under hoods, transmission tunnels, floorpans, fuel cells, exterior under-vehicle locations – anywhere to reflect damaging heat. Floor and Tunnel Shield II is available in three sizes: 21” x 24” (3.5 sq. ft.), 21” x 48” (7 sq. ft.) and 42” x 48” (14 sq. ft.). Part numbers: 050507, 050508 and 050509 respectively.